I love this recipe. It is full of delicious and colorful vegetables, and it is SUPER delicious. It is adapted from a Martha Stewart recipe (seriously, it should be called Martha’s Meatless Mondays). I switched it up a little bit because I wanted to add a little extra protein. So I cut the amount of pasta in half and added a package of tofu. If you are new to tofu, give it a shot. I grew up eating it, and I think of it like chicken: On it’s own, not so delicious, but it easily takes on the flavor of whatever you are cooking it with and packs a lean protein punch. 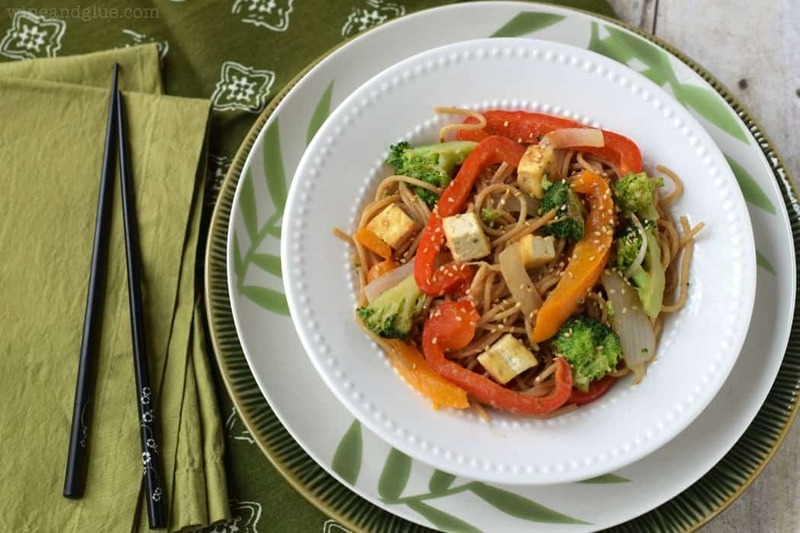 One package of tofu has 190 calories, 10 grams of fat, and 20 grams of protein. So give it a shot with this recipe, and let me know what you think. Heat a skillet over medium heat. Drain the tofu and cut it into 1/2 inch pieces. Add a small amount of oil to the pan, and fry the tofu until it is crisp around the edges. Remove from heat and keep off to the side. While the tofu is cooking, bring a large pot of water to a boil. Add salt, and the pasta, cooking three minutes less than the package directions. Add the vegetables and cook until the pasta is al dente and vegetables are tender. About three more minutes. Drain vegetables and pasta, reserving 1/2 cup of pasta water. 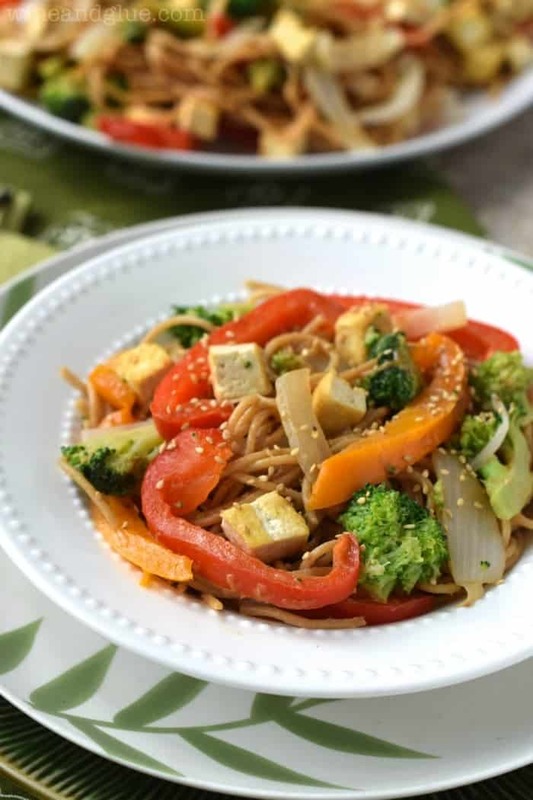 In a large bowl, whisk together the peanut butter (microwaving it for 10 to 30 seconds makes this easier), brown sugar, rice vinegar, soy sauce, sesame oil, garlic cloves, and red pepper flakes. 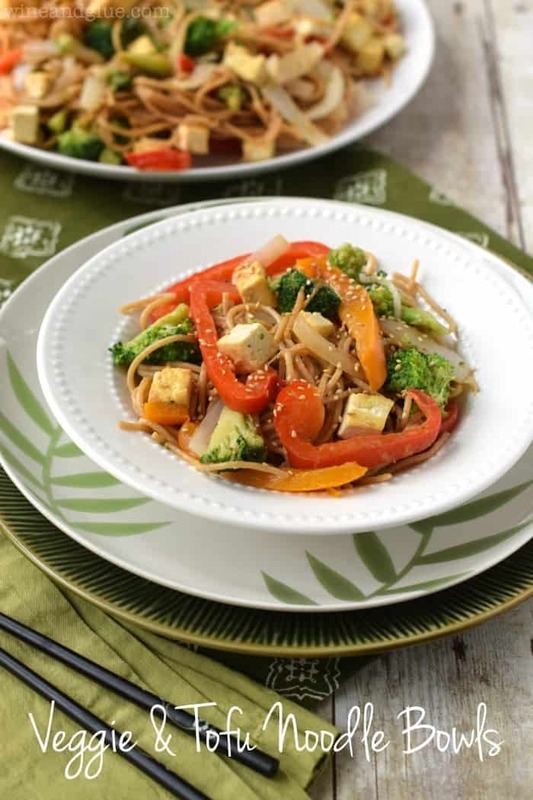 Add the pasta, vegetables, and tofu to the peanut butter sauce, adding a little pasta water at a time if it needs to be thinned out. Top with sesame seeds, and serve either warm or chilled, it's very good either way! I don’t have a day job either 🙂 and I admit, I do find tofu a little scary BUT you make it look kind of good. P.S. I am your newest Facebook fan! With a name like Wine and Glue, I feel like we could really be friends one day. Secondly, I’m Erin, formerly of EKat’s Kitchen, and now of the just-launched SalmonAtSeven.com. I’d love it if you stopped in, said hello, and entered the giveaway I’m hosting in celebration of my launch. Just wanted to tell you that I saw this recipe on Pinterest and tried it tonight. It was DEE-LISH! Thank you! !